The British Museum is the first public museum in the whole world. It first open its doors in 1759, free to visit for the studious and the curious. The museum has some of the most important and relevant exhibits in the whole world. For me, Hampstead Heath is the real gem of London and at the heart of it is what is locally known as the Secret Garden. Not many knew of this garden’s existence. It is not well sign-posted. We only found out of this garden more than 25 years ago when we stumbled upon it while we were out walking at the Heath extension towards Wildwood pond to look at frog spawns. The secret garden is really called Hill Garden and Pergola. It is a very tranquil and romantic place; very verdant place with all the plants flowering from trees, bushes, bulbs, climbers and borders. The pergola is strewn with roses and clematis. It is a romantic combination of Italian, French and English garden ambience. Only a few people would wander down to this sumptuous location. I keep thinking that it could be the perfect venue for a wildly romantic wedding or even a marriage proposal. If you happen to be at Golders Hill Park, try to drop by the Hill Garden as well which is about 500 metres away. Now that the weather is really more spring-like, why not bring a book and wander down to the Secret Garden of Hampstead Heath. It would be a treat. The subway to Charing Cross station has an amazing array of mural tiles. Amazing not only aesthetically but amazing because they show a brief but concise history of the nearby locale, how the place was built, what took place. The whos, the whats, the wheres, and the whys were more or less dealt with by the history in tiles. Walking through the tunnel and underground is interesting and informative, the thing to while away the time when waiting for the next tube, especially when there are some delays. It is also good for tourists and visitors alike to note what to expect outside or why outside became what it is. Ancient Egypt has been a keen interest of mine for many years. From 3000BC to 672–332 BC This magnificent civilisation flourished and influenced many other civilisations such as the Greeks and Romans. The ancient Egyptians build some incredible monuments and temples. Their greatest achievement was the construction of the Pyramids which were elaborate tombs for their Kings/Pharaohs ensuring transit to the afterlife which the pharaohs people could hopefully share in after helping construct these majestic monuments. It was so see the pyramids up close and personal. Below is an interesting article from Ben Gilland @ Metro Newspaper on the latest theories of how the pyramids may have been built. JW3: is London’s latest cultural centre ‘a new postcode for Jewish life’? With thick glasses, substantial sideburns and a brown tweed jacket that give him the look of someone fresh from a Woody Allen film set, Simonson is the chief executive of a new multimillion pound complex that aims to provide a home for all of the above. Hovering like a low-slung liner, its long ribbons of windows separated by crisp bands of white concrete, JW3 (a riff on its home in NW3) declares itself to be “a new postcode for Jewish life” – with not a Torah or menorah in sight. Set to open at the end of September after 10 years in the making, it is the brainchild of Vivien Duffield, whose Clore Duffield Foundation stumped up £40m of the £50m project cost. It was inspired by her visit to the vast Jewish Community Centre (JCC) in New York, a multi-storey beacon of Jewish culture in Manhattan that made her wonder why London didn’t have the same. While New York’s look-at-me JCC seems like a slick private club, complete with a flashy sixth-floor swimming pool, London’s version speaks more softly. Set back from the roaring six-lane traffic on Finchley Road on a sloping site, accessed from a bridge that crosses a large sunken courtyard, its four storeys only read as two from street level. Designed by Lifschutz Davidson Sandilands, purveyors of inoffensive modernism-lite, it is dressed in understated beige, brick and reconstituted stone. It is trying to be the Savile Row to the loud Wall Street pinstripe – but it comes off looking a bit M&S. “We knew we couldn’t just plonk the JCC down here,” says Nick Viner, JW3’s outgoing CEO who has steered the project since the beginning. He cites Hugh Casson’s Ismaili Centre in South Kensington and Denys Lasdun’s Royal College of Physicians by Regent’s Park as projects he was keen to emulate. Both contain a series of auditoriums and rooms arranged around large public levels and atriums. Both are also wrapped in fortified shells, standing like cultural castles ready to defend against an oncoming siege. By contrast, Viner wanted JW3 to have “an open civic quality, not look like an exclusive club,” though this is not particularly evident from the street. The bridge, accessed through a big metal gate, reinforces the sense of a secure site, while a giant glass fence marches along the pavement, allowing passers-by to look down on activities in the sunken piazza – an us-and-them relationship with unfortunate connotations of a zoo enclosure. The whole thing is towered over by a nine-storey block of swish apartments, a necessary planning condition, replacing the same number of homes that were on the site before. The fact that the building looks like an embassy should not come as a surprise: it is intended as something of a Jewish cultural ambassador. Within its relatively small footprint, it somehow contains a 270-seat auditorium, a 60-seat cinema, a restaurant and bar, a demonstration kitchen, dance studios, classrooms and medical clinics. This leisure sandwich is even topped off by a penthouse nursery with a ziggurat of ball pools and sandpits on its own roof terrace. It is the kind of ambitious hybrid offspring that might be produced if an academy school had a lovechild with the Barbican. “We would like to be mentioned in the same sentence as the Barbican,” confirms Viner, “along with the Southbank Centre, or the Roundhouse or Rich Mix.” With the Camden Arts Centre across the road, he hopes JW3 will lead to an “emerging arts hub” in this corner of Hampstead. Being in Hampstead, the centre has a guaranteed catchment and builds on a strong history of cultural life in the area. It is just down the road from the home of Habonim, AKA the “Socialist Zionist Culturally Jewish youth movement,” a group where Mike Leigh, Sacha Baron Cohen and David Baddiel started out telling jokes. In their honour, JW3 will host a Jewish comedy club called HavaNaGiggle, plus a comedy class for pensioners – “standup for the sit-down age group” as Simonson has christened it. JW3 is at pains to point out that it is not a religious centre. It may have the largest Shabbat-compliant lift outside Israel – programmed to function automatically on a Saturday, stopping at every floor – but there is nothing expressly Jewish about the building. “I hope people that might never think of going to a synagogue will come here,” says Simonson, adding that the programme should appeal to the new kind of “three-days-a-year Jew”. “That used to mean going to the synagogue on our three holiest days,” he says, “but now there is a generation that might go to the Jewish Film festival, Jewish Book Week and Limmud, a sort of Jewish Edinburgh festival. 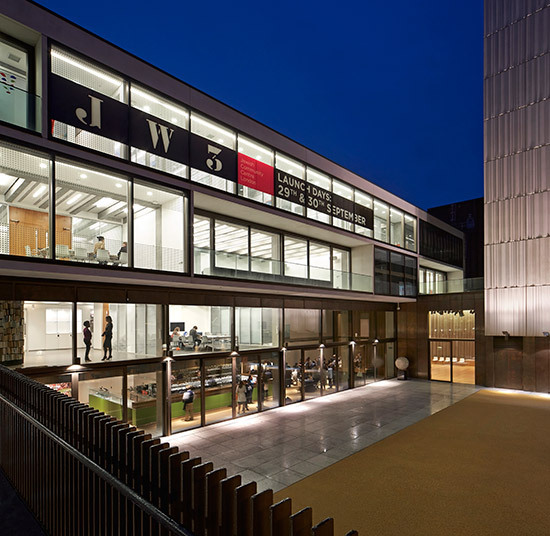 The idea of JW3 is to have this festival 52 weeks a year, open to everyone.” With an energetic director at the helm, and a long list of wealthy benefactors, the centre has every hope of adding another dimension to London’s vibrant cultural life – just as long as it can lure people past the fences and across the bridge.